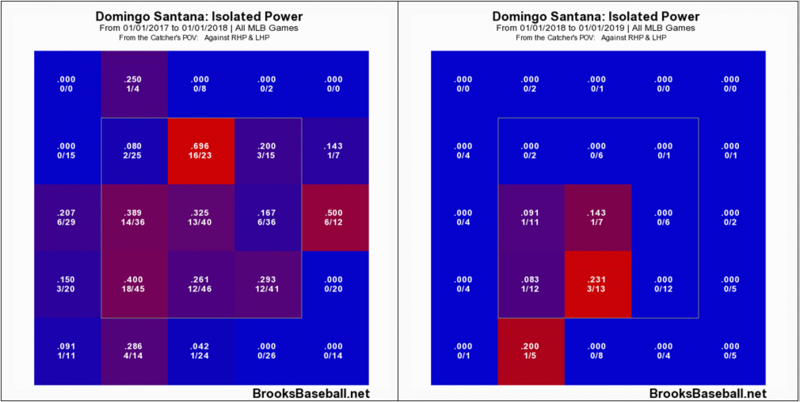 What happened to Domingo Santana’s power? Domingo Santana hit 30 home runs last season. 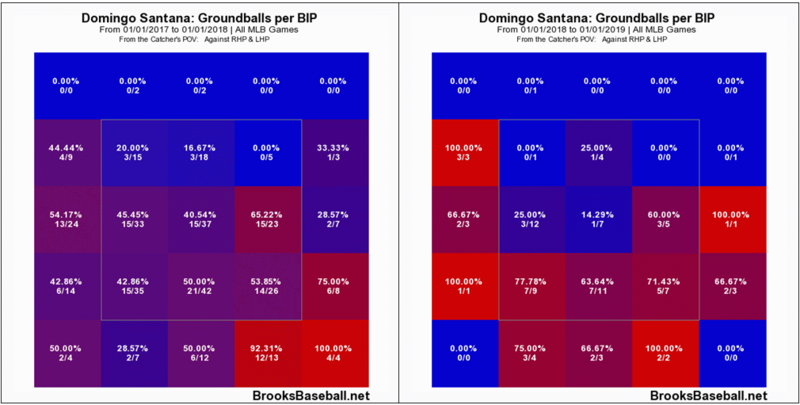 Domingo Santana hit 30 home runs last season because he’s a good player with power. Domingo Santana has one home run this season. It’s May 14. Before going any further, here’s a table of how Santana performed from the beginning of 2017 to May 13 of the same year, along with nearly the same range of dates from this season. Santana’s playing time is almost identical, and thanks to three hits — including a double — in five trips Sunday versus the Rockies, his on-base percentage is a mirror image, as well. Of everything on the table, though, it’s his power numbers that draw the most attention, particularly in the home run and isolated power department, and it’s clear Santana has gotten off to an excruciating slow start. Now, this table doesn’t tell us much without context, which is why I’m about to give you context. I wouldn’t be much of a writer if I didn’t. There’s a handful of reasons why Santana has been no power threat whatsoever at the plate, with one in particular that’s quite fascinating. But for now, let’s look at his batted ball profile. Nearly 31 percent of Santana’s fly balls landed over the fence in 2017. Only Aaron Judge and Giancarlo Stanton finished with higher home-run-to-fly-ball ratios, and while that’s amazing company to share, I think we can all agree Santana doesn’t belong in that group. Negative regression was bound to happen. However, that regression has overcompensated. Santana’s HR/FB% currently sits at 5.3 percent. That minuscule number won’t last, but it is discouraging, especially when you realize Santana is hitting the ball on the ground more than ever before. Milwaukee’s right fielder entered the season with a career ground-ball rate of 43.4 percent. He hit 44.9 percent of his batted balls on the ground a year ago, while both his line-drive rate and fly-ball rate flirted around 27.5 percent. That has completely changed. Currently, Santana is hitting the ball on the ground over 54 percent of the time, and that just happens to be the 13th-highest mark of every qualified hitter in Major League Baseball. For a guy who’s considered a power hitter, that’s not exactly a good stat to have next to his name. Meanwhile, his fly-ball rate has fallen to 22.9 percent. What happened? Why is he hitting more ground balls? Well, the biggest reason is that Santana is having a tough time handling inside pitches. This is the interesting part. Get ready for some visuals. Last season Santana crushed inside pitches. Especially the low, inside ones that found the strike zone. This year? Different story. Despite his success last year, pitchers are testing him even more inside, and more often than not, they’re finding success. Take a look at the same breakdown except with grounders. In the age of the launch angle revolution, Santana has been one of the few outcasts this season. Instead of lifting those balls like he’s been known to do, Santana has been weakly rolling over them and driving them into the ground at an insanely high rate. His launch angle has dropped from 10.5 degrees to 9.9 degrees. Yes, the overall sample size is still relatively small, but over 130 plate appearances is nothing to scoff at. Santana’s seeing more inside fastballs than what he’s normally accustomed to, but he’s been very capable against fastballs during his career (.243 ISO against four-seam fastballs), so that can’t be used as an excuse. Maybe Santana isn’t seeing the ball as well or maybe his bat speed has slowed down, but this has become a problem. Defense has always been a black mark on Santana’s record, and if you take away his ability to hit home runs, he turns into a league-average player at the very best. He needs to hit home runs in order to be serviceable. He needs to hit home runs if he expects Counsell to write his name on the lineup card every day. He needs to hit home runs. Period. And that starts with him figuring out a way to not only start elevating the ball again, but also how to once again remaster the inside pitch. This entry was posted in Ground Balls Galore and tagged Domingo Santana, Milwaukee Brewers on May 14, 2018 by Justin Schultz.